Leverage the capital planning information you enter in Capital Forecast with dynamic and easy to use reports. The reports are used to quickly see trends in the allocation of your resources. There are dozens of PDF and Excel reports available, all with customizable filter options. You can also run reports by clicking on a link in the Information Analysis section of the home page. 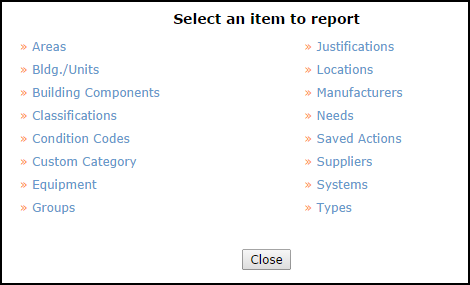 Hover your mouse over the Shortcuts menu and click the Report link to access the report criteria selection page. Enter the filtering criteria for your report. The more information you select, the more narrow and specific your returned results will be. If you need to highlight more than one item in a selection box, click on your first item, then hold down your Ctrl key when selecting the others. At the bottom of each report screen, you will be asked to choose the Report Type. This usually includes a Summary Report and a Detail Report. (There may be other options on some reports.) Each report type includes varying degrees of detail and different formatting. Try each one until you find the one that includes the information you want. Click Print at the bottom of the page to view a print preview of your report. You can then send it to your printer. If the report you are running has an option to save at the bottom, it means this report can be used as a Saved Action. You can enter a title in the Saved Report Information field and click Print and Save to make it available on the Saved Action screen.